Over the years I have worked in psychiatry in two London hospitals ( The Whittington and UCH) and in psychological treatment services at Addenbrooke’s, where I offered help to individuals and groups with a range of mental health issues from self harm to generalised anxiety and depression. More recently, I headed up a university counselling and wellbeing service for several years, developing expertise with young people and also offering psychological support for teaching staff, often with work related stress. I have now returned to full time private practice, where I offer professional, confidential psychological support with relationship, mental health or emotional issues. Loss, divorce, mid life crisis as well as serious mental health issues can be worked through successfully with appropriate intervention- and with a compassionate therapist. Working out what you need and how to get help. When you are anxious or depressed, at difficult or distressing times, I recognise that taking the first step to finding a therapist or counsellor takes courage; however, it is a crucial step on the road to feeling a bit more in control of your life. 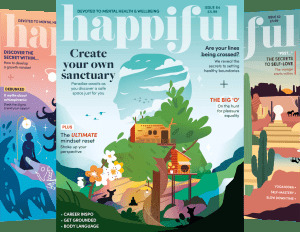 Talking about your issues with a mental health professional or simply having safe space to reflect on life’s challenges with a therapist who will engage with your concerns can be life changing in getting you back on the path of a happier, more fulfilling life. If you are a young adult struggling with anxiety or trying to work out which path to take, I may be able to help you. Adolescence is often a turbulent time for many teenagers and young adults. My years working in colleges and running a university counselling service has enabled me to develop expertise in working successfully with many young people. I also work extensively with individuals, couples or groups struggling with making changes in their lives. I run groups for women with post natal depression, or simply struggling with mothering. I am currently establishing a new group for women with post natal depression, this is open for referrals from GPs or you can refer yourself. I offer short term, solution focused counselling or long term psychotherapy, both of which can be very helpful in bringing about changes, helping you deal with stress and anxiety and depression and improve your wellbeing. You are welcome to get in touch with me today to set up an initial appointment. You can call me on: 07941760463 or click here to send me an email. I have two busy clinical practices in Cambridge, one in the city centre, In CB2, the other on the edge of town, in Madingley Rd. Both have parking facilities. My background in the field of psychotherapy, counselling, education and training, as well as psychiatry and psychological treatment services means I have gained considerable expertise in offering psychological support and helping individuals finding ways through difficult times. I have also worked with women and men in mid-life crisis and wellbeing groups in the voluntary (Charity) sector. I offer clinical supervision for trainees or qualified counsellors and therapists - I am a registered supervisor with UKCP - see supervision link below. My approach is psychodynamic, since I think psychotherapy can help us understand the unconscious processes that influence our lives, relationships and choices. Understanding the impact of past experiences can help us take more control of our lives to make the changes we need. I work long term or short term for brief, focused work, where I can also offer CBT techniques. Couples seek counselling for many reasons. Sometimes, after years of marriage, couples grow apart, or kids leave home and individual partners find they are strangers who have lost touch with one another's needs; or have got stuck in negative ways of relating to each other, or one partner might have strayed off the path of fidelity; or perhaps couples simply feel that they have begun to inhabit different worlds. These are some of the issues couples bring to couple work. As long as you each bring a commitment to explore the issues as you see them, couple work can be very helpful with a compassionate therapist, able to hear your dilemmas, reflect back, facilitate your processes and help you both find a way through to some clarity, whatever that might be. I have found, over the years, that one and a half hours of structured time works best for each session, to allow adequate exploration of whatever emerges in order to fully appreciate the complexity of couple work, and find ways towards resolution of difficulties. Graduate of The Guild of Psychotherapists. Working in psychiatry and Psychological Treatment Services. I work within the BACP ethical framework and UKCP's Ethical Principles and code of professional conduct, both of which help to establish best practice in the field of counselling and psychotherapy for clients. I have considerable experience working with young people and those in mid-life facing changes. I am very experienced in working with couples in difficulty. I offer support to individuals making changes and transitions in their lives. Initial phone assessment lasting up to 15 minutes is free of charge. This is usually followed by an initial consultation of about an hour. Fees are from £70. My fees for individual sessions are from £70 for one hour (in certain circumstances, this fee can be reduced - I do allocate some low cost spaces). Couple work is £120 per one and a half hour session. Group Work fees on request. Do get in touch with me today for an initial consultation, without any obligation. You can call me on: 07941760463 or click here to send me an email. "having a glass wall between myself and my baby"
I am fully Insured. I have an enhanced CRB check. 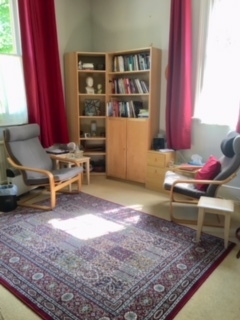 My consulting rooms in both clinical practices are professionally designed rooms in confidential, counselling/ psychotherapy settings in Cambridge, each with car parking spaces available, on bus routes and close to the station. I am a registered supervisor with UKCP.